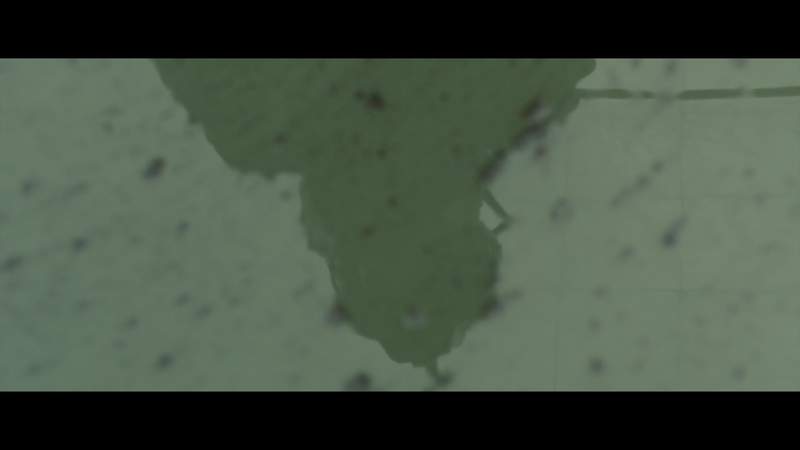 An unknown character's reflection is visible on the surface of muddy water. The camera tilts upward as the man reaches under the water and grabs a bunch of worms in his hands. He notices an aircraft (known as a spinner in the film) fly nearby. The spinner lands and dust fills the air. 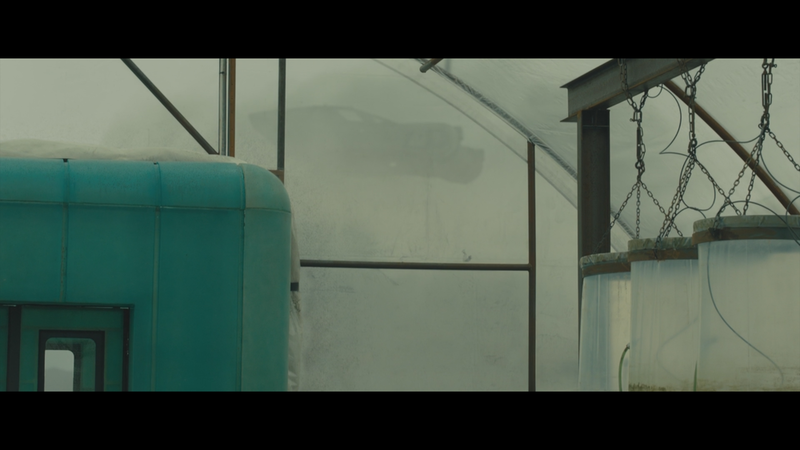 In a previous scene, Ryan Gosling's character, 'K,' is shown riding the aircraft that just landed. 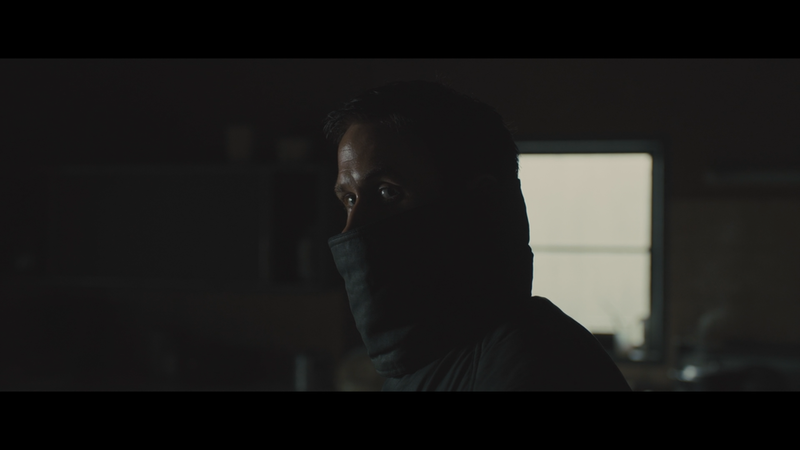 Rather than keeping him in the spotlight, we are introduced to a new character, a protein farmer, and we see the next few shots in this character's perspective. Based on my movie viewing history, opening scenes tend to stay fixed on one character, but I believe Denis Villenueve intentionally chose to shift characters quite early in the film to build tension and keep both characters on an equal playing field. 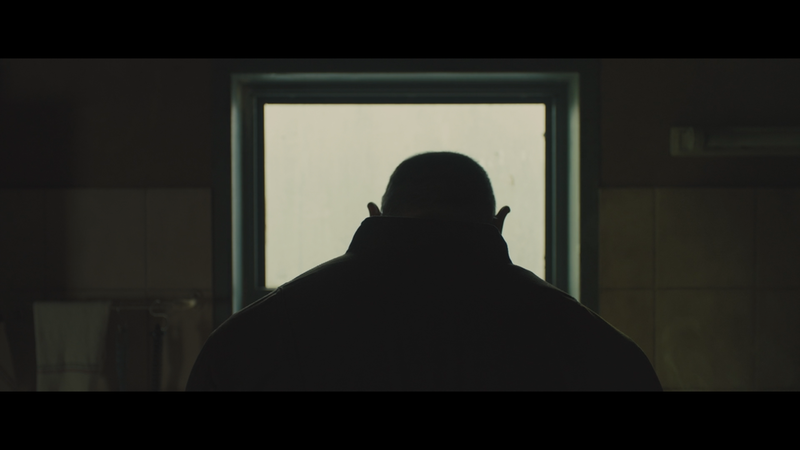 In terms of the cinematography of this scene, I like the way the first shot of this character starts with a medium-shot of his reflection (1) rather than his actual face. The camera tilts up (2) but it does not go past his ankles. We then cut to a full shot of his whole body (3), getting a better sense of his surrounding but still unable to identify who he is. By limiting our visibility of his physical appearance, Villenueve is purposefully withholding the character's identity for a later scene, and as a result, heightening our curiosity. (3) Great composition in this shot through the use of leading lines, natural framing, and symmetry. The sequence ends with a mid-shot of the protein farmer looking at K's aircraft flying above (4) and cuts with it landing nearby (5). (4) The main subject, K's aircraft, is highlighted by using natural framing. Also, by using a low-angle shot, the character appears massive in comparison to the aircraft. Once the spinner lands, a drone exits the aircraft and levitates upwards nearby a lifeless, gray tree. We then see 'K' walk through the dense fog, observing the environment around him. He peers at nearby facilities that look like greenhouses while walking towards a building with a yellowed entryway. He arrives in front of the yellow door, pauses, and quickly scans his surrounding. We see 'K' enter a dimly lit living room and slowly walk towards the kitchen. A pot is boiling on the stove top, the blue flames bright and active. Someone is home. 'K' turns around and glances behind him before cutting to the next shot. 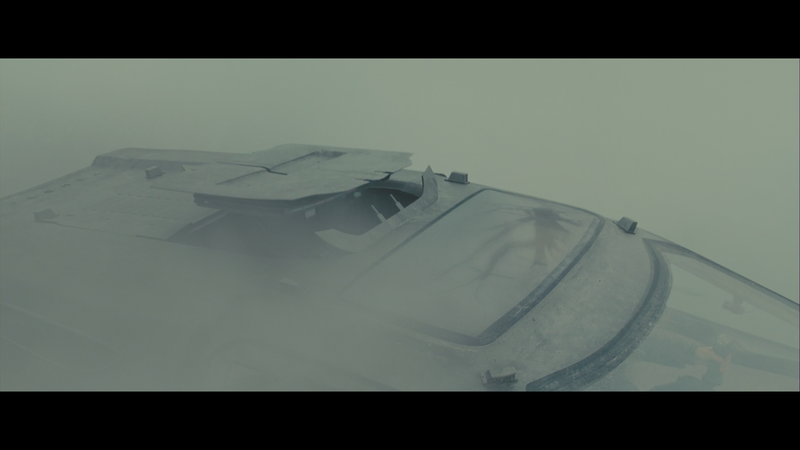 It's easy to miss, but the reflection of the tree can be seen on the spinner's front window (1). The camera then tilts upwards, revealing the tree in the center of the frame (2), pausing ever so slightly before cutting to the next shot. The use of negative space and center composition seems to suggest that the tree holds some value. These details may seem insignificant, but they help draw the audience's eyes to objects that not only hold symbolic meaning but play a part in the plot of the story. 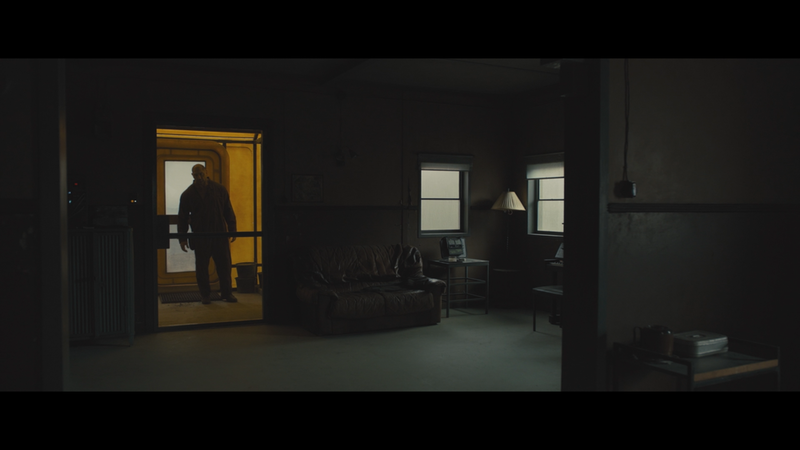 The building 'K' enters is, in my opinion, one of the most beautifully lit sets in Blade Runner 2049. Roger Deakin's minimalist approach to lighting is perfectly appropriate for the introduction of the film. With the windows as the main light source, the interior is dark enough to give off a moody, eerie vibe without completely crushing the blacks in the shadows. 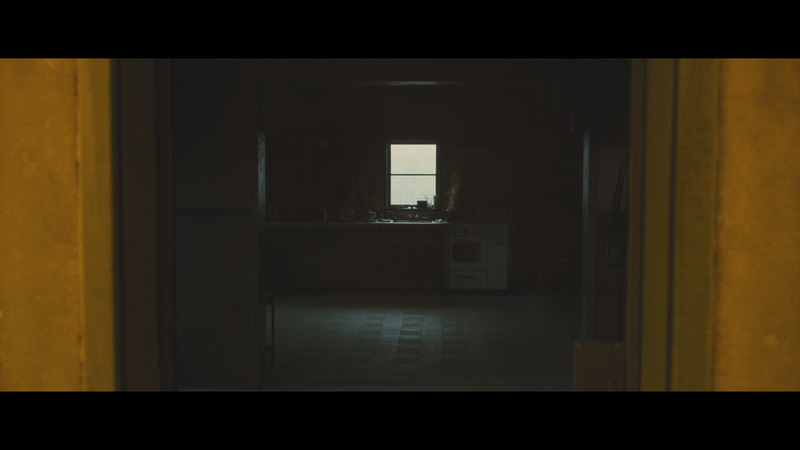 The shot of the kitchen (9) is a great example of how a dimly lit set can still retain a ton of details. (6) Great depth in this shot. You have the "greenhouse" in the foreground, 'K' the resident facility, a tractor, barrels, and more miscellaneous props in the middleground, and the mountain/hills in the background. (10) Nice, subtle lighting on 'K's face. When watching this scene for the first time, I caught myself first staring at the bright window, the light reflecting off his forehead, then finally to the whites in his eyes. This is a good example of how proper use of minimal lighting can help achieve interesting images. The protein farmer rinses his suit before off his helmet, finally revealing his face. He looks towards his left and sees the spinner parked next to the leafless tree. The drone is seen patrolling the surrounding. The way that the film shifts from the perspective of one character to another seems to indicate that at this point of the film, both characters are on an equal playing field. We don't really know who the main character is because both roughly get the same amount of screen time. We see what 'K' sees and also what the protein farmer sees. Is one the hero and the other the villain? Suspecting that someone may have broken into his home, the protein farmer walks cautiously towards his kitchen. As he gets closer to the kitchen sink, we see 'K''s silhouette against a window nearby. He is sitting quietly. The protein farmer washes his hands in the kitchen sink. Then the first lines of dialogue begins. Again, the use of minimal lighting to create great contrast between lights and shadows is exemplified perfectly in this scene. In the first shot, silhouettes of the characters created by the warm light near the entrance of the home and the cool window lights visually help guide our eyes to the subject. The use of silhouettes to frame the characters is also present in shots 4 through 9. These lighting techniques help add mood to the environment of the scene and add beauty to what is a relatively mundane room. (1) This shot was photographed beautifully. Two windows and a doorway are positioned in the center line of the frame. 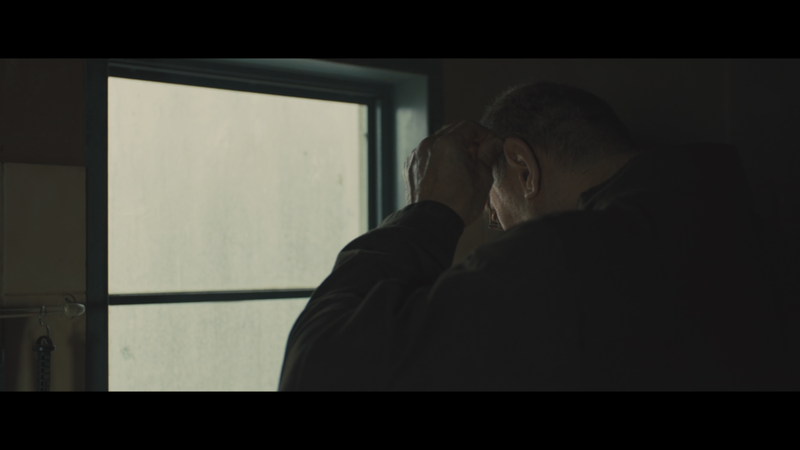 By differentiating the the doorway to the two windows with varying color temperature (warm vs. cool), dimension (large vs. small), and content (subject vs. no subject), the protein farmer stands out. (3) The use of contrasting colors makes this shot really dynamic. (4) Silhouettes created beBoth 'K' and the protein farmer are framed using the window light. Though blacks are dominant in this shot, there's enough light to illuminate the kitchen and ground. The shadow on the ground below the protein farmer adds a nice touch to this image.